The California State Athletic Commission has suspended a total of 14 athletes for various injuries sustained in their respective scraps at UFC 117 on August 7th, including main event fighters Anderson Silva and the nearly-perfect Chael Sonnen. Despite entering the highly anticipated affair as a heavy underdog, Sonnen dominated the middleweight king for 23 minutes and 10 seconds of their lopsided contest. However, a slight lapse in concentration cost him the opportunity of a lifetime when Silva wrapped his lanky legs around Sonnen’s neck and submitted him with a miraculous triangle-armbar submission at the 11th hour. In their own way, each put on the performance of a lifetime and will now be forced to sit the sidelines for their efforts. “The Spider” could be riding the pine for as long as 180 days due to the ribs he reportedly injured prior to his tango with Sonnen. Although, he could be cleared earlier with a doctor’s note. 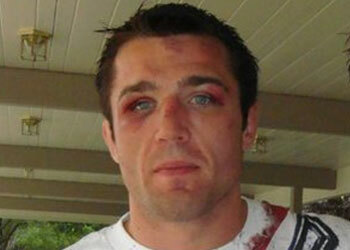 Sonnen, on the other hand, will be benched for two months because of the lacerations on his face. – Anderson Silva was suspended for 180 days unless he has a possible rib fracture X-Rayed and cleared by a physician. He was also suspended for 45 days, with no contact for 30 days, and needs neurological clearance and a head CT.
– Chael Sonnen was suspended for 60 days, with no contact for 60 days, for a laceration. – Rafael dos Anjos was suspended for 180 days unless he has a possible rib fracture X-Rayed and cleared by a physician. He must also have a head/jaw CT cleared by a maxillofacial surgeon. – Junior Dos Santos was suspended for 60 days unless he has a right cheek laceration cleared by a physician. – Roy Nelson was suspended for 45 days, with no contact for 30 days, for a hard bout. – Dustin Hazelett was suspended for 45 days, with no contact for 30 days, for a TKO, and needs a new physical. – Phil Davis was suspended for 180 days unless he has a possible right fifth metacarpal fracture cleared by a physician. – Charlie Brenneman was suspended for 45 days, with no contact for 30 days, and needs a new physical. – Tim Boetsch was suspended for 60 days unless he has a left facial laceration cleared by a physician, and was suspended for 180 days unless he has a right thumb fracture cleared by a physician. – Todd Brown was suspended for 60 days unless he has a laceration cleared by a physician. – Stefan Struve was suspended 60 days unless he has a lower lip laceration cleared by a physician. – Christian Morecraft was suspended for 180 days due to a hard bout and is required to get a head CT. He was also suspended 45 days, with no contact for 30 days, for a TKO, and was suspended 60 days unless he has a right eyebrow laceration cleared by a physician. – Dennis Hallman was suspended for 60 days unless he has a left cheek laceration cleared by a physician. – Ben Saunders was suspended for 45 days, with no contact for 30 days, due to a hard fight.